The good Olde Bible Way--It still works in our day! God's Word NEVER Changes--Its For YOU! 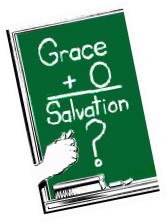 GRACE + Zero = SALVATION? In an editorial one minister declared, "There is nothing that can be added to grace to bring salvation to a soul. "Grace;" he wrote, "wrought salvation with no strings attached." Another minister stated, "Grace plus nothing equals salvation." the text by small numerals in parenthesis) are provided ... for further in-depth study at a later time. The three words of this title come from Luke 13:5, which reads, "Except ye repent, ye shall all likewise perish". Plainly, then, the tragic alternative to repentance is eternal perdition. In view of this fact, it is extremely important that everyone knows what repentance is and how it is accomplished. This question is of vital importance because of the fearful judgement against those who commit sin. "The soul that sinneth, it shall die," thunders the Old Testament (Ezekiel 18:20). 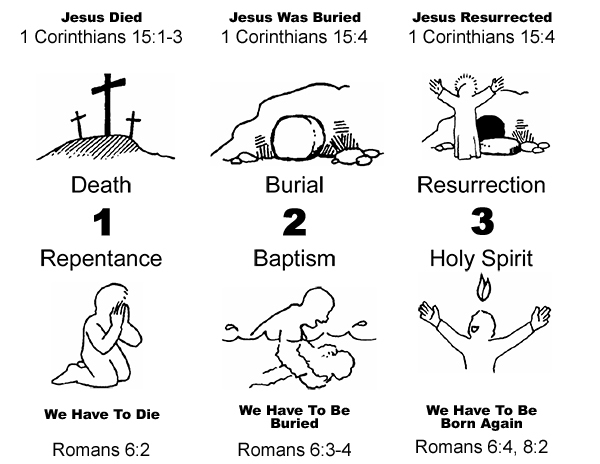 In like tones, the New Testament declares: "The wages of sin is death" (Romans 6:23). The one who lives in sin throughout his earthly life and faces God without having obtained divine forgiveness will be sentenced to eternal perdition. Sin sprang full-grown among men. Adam and Eve sinned by disobeying God. The first boy born on this earth grew to manhood and murdered the second-his own brother! And sin has existed in every generation since. In our time, however, there is one difference: many no longer know what sin actually is. Things evil are sometimes designated as good; things good, as evil. Isaiah condemned such a practice, declaring, "Woe unto them that call evil good, and good evil" (Isaiah 5:20). Since this confusion exists, and since a person will not seek forgiveness for sin until he knows what sin is, a clear-cut definition, both negative and positive, is urgently needed. The gift of the Holy Spirit has become the topic of much discussion in our day. Men and women of all persuasions and from all walks of life have become interested enough to search for greater understanding of this phenomenal spiritual experience. Capturing headlines, dominating the content of many religious periodicals, and generally creating excitement, this canon of apostolic faith deserves a sincere appraisal. The Holy Spirit is God. "God is a Spirit" (John 4:24). "There is . . . one Spirit" (Ephesians 4:4). To become a subject in the kingdom of God, Jesus said a person must be "born again," or "born of water and of the Spirit" (John 3:3-5). The birth of the Spirit and the baptism of the Spirit are synonymous terms. The Apostle Peter understood this truth as he spoke. to the multitude in Jerusalem on the Day of Pentecost: "Repent, and be baptized every one of you in the name of Jesus Christ for the remission of sins, and ye shall receive the gift of the Holy Ghost" (Acts 2:38). This experience was received by the Jews on Pentecost (Acts 2:1-4), the Samaritans (Acts 8:15-17), and the Gentiles (Acts 10:44-48), plainly indicating that it was meant for all people, regardless of race, creed, color, or station in life. The new birth, consisting of water and Spirit, was never set forth as being optional or unessential. "Ye must be born again" are the words of Jesus in John 3:7. Until a person is born of the Spirit, he cannot be called a "son" of God. Have you been baptized in the Name of Jesus Christ, for the remission (forgiveness) of your sins? The subject of water baptism has long been called a great issue and no doubt has been made such by many church leaders of the past and present. In our study of it, let us first consider its importance, or the necessity of being baptized. He was a deacon in a fashionable church, but he did not believe in the Pentecostal doctrine relative to the baptism of the Holy Ghost. Yet he had been exposed to that belief through members of his immediate family. One night, at the close of an Evangelistic service in an Apostolic church, he went forward to pray and was overwhelmingly filled with the Spirit of God. He spoke in other tongues fluently and was so inundated in the Spirit that even hours later he could not speak English. Definitely, this was a biblical experience accompanied not only by speaking in another tongue, but also by the joy and peace of the Holy Ghost. Millions have experienced this same baptism in the Spirit. Wherever this message is proclaimed, the question is asked, "Why did God choose speaking in tongues as the initial, physical evidence of the baptism of the Holy Ghost?" There may be many answers to this question, and perhaps we do not know them all. Several key points are apparent, however. God is the Great Physician. His knowledge of the human mind and body is complete. He can do more for the sick and the diseased than can all earthly doctors and surgeons combined. He created us; is it not reasonable, then, to believe that He can heal us when we are sick?